I hope you had an enjoyable holiday season. Our three daughters all visited on Christmas day and two stayed over for Boxing Day. It’s truly a pleasure to have everyone together. It seems to happen so rarely, these days, with everyone busy with their own full lives. 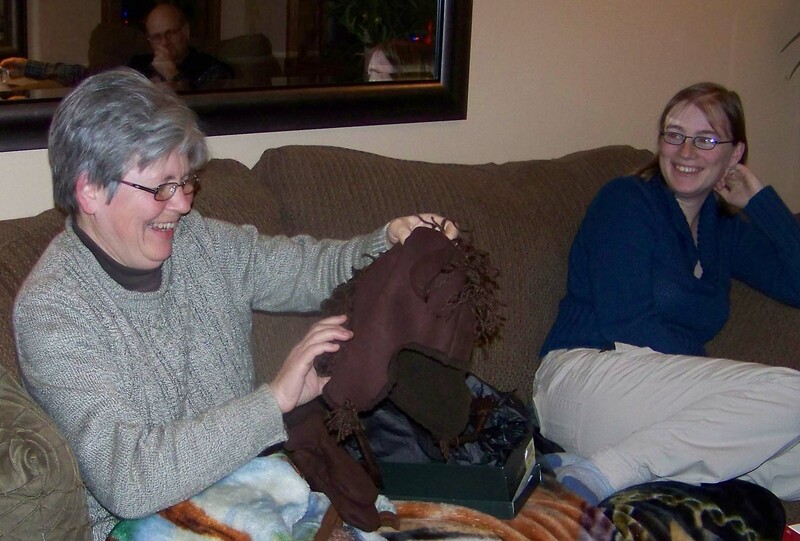 When the girls were youngsters, there was much excitement about gifts and stockings. Now, just being together is the most wonderful thing. That’s not to say there weren’t lots of presents though, as everyone does their best to find just the right thing for each of the persons on their list. It’s nice to be able to make your own gifts. 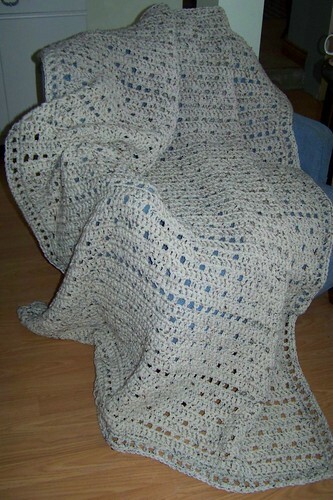 This year, I finished an afghan for Ponygirl. It’s a double-weight geometric pattern crocheted with aran-fleck yarn, warm and cozy for cool winter evenings. I also finished knitting a scarf, an abandoned project that I finally got completed. The scarf has now been united with its matching hat! 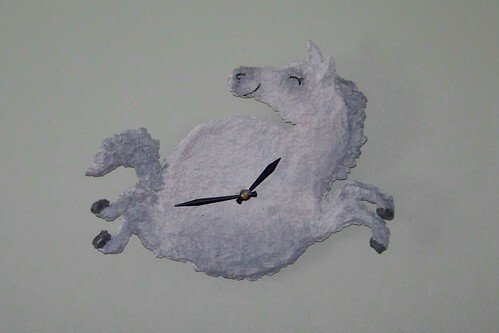 The best handmade gifts were made by Birdgirl, who surprised us all with custom clocks that she constructed with papier-mache and a lot of imagination. My clock features a gleeful Mousie. The artwork captures perfectly the delight Mousie displays as she gallops gaily about her paddock. A wonderful present. It was my birthday on the weekend. That makes me a Sagittarius, an archer whose aim is heavenly bent, will not stoop to low or evil intent. Sagittarius the centaur. The best gift is always spending time with loved ones, and I had a very nice birthday with the family. 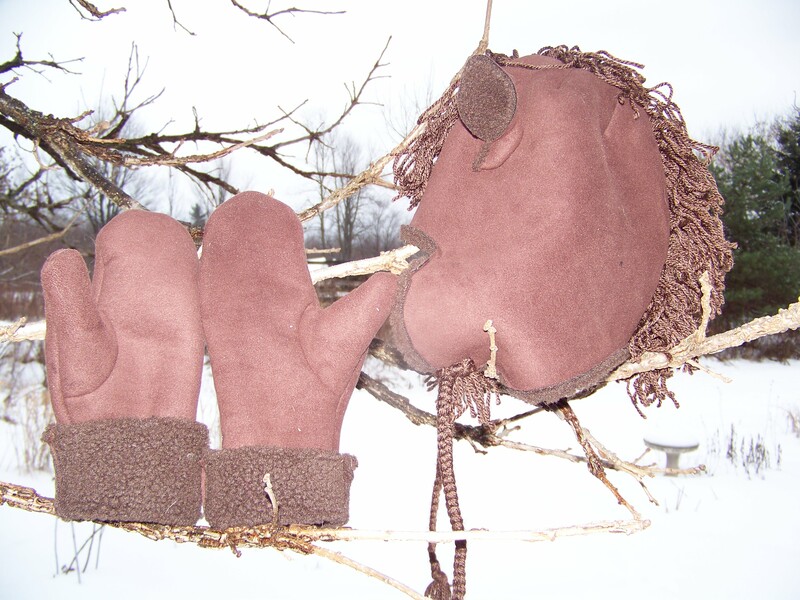 However, Birdgirl surprised me with a handmade gift, a hat and matching mittens, a soft, brown hat to warm any (slightly eccentric) horselover’s heart and head, complete with a woolly horse mane and 2 perky ears! Perfect. When I went out to the barn on Monday morning, I was greeted by a sparkling world. It was a beautiful start to the day. The sun, of which we have seen precious little of late, was shining for all it was worth. The wind was nowhere to be found, and in spite of the frost coating every blade of grass, the day felt comfortable and inviting. My first stop is at the barn, where I dole out the morning ration of grain, just a handful, to Mousie and Czarina and Louis. It’s such a small amount, it’s little more than a token treat, but they wait anxiously for this little goodie each morning. Lately, I’ve been able to supplement their usual tidbit with an apple or two, windfalls purchased in bulk for the animals from the local orchard. Apples are Mousie’s favorite treat. Apples, carrots, a bit of grain, it’s all good with Czarina. She seems very content these days, less fractious than her old self. Maybe old age, or at least maturity, is mellowing her. Louis much prefers corn, but corn season is done for another year. He likes apples better than carrots, if that’s all that’s on offer. Soon everyone has finished their little treat and they have settled down to a pleasant morning nibbling on their hay. I leave the horses to their breakfast and walk out to the field to admire the frost. Already the sun is melting it away. For just a little while longer, though, every stem of goldenrod, every patch of clover, is daintily etched with frost. Down by the pond, the morning is still, quiet and calm, and peaceful. Finally, I head back inside for my own breakfast. Momcat is stretched out on the windowsill, enjoying the sunny morning too. At the beginning of the week, we had some much-needed rain. Actually, we had a LOT of rain, with a heavy downpour on Wednesday. Consequently, I welcomed the sunny weather on Thursday, an absolutely beautiful fall day, and I couldn’t resist idling away part of the afternoon with a tour around the property. Here are some of the sights I saw. Behind the house, the maple leaves are beginning to turning bright colours, although there is still a lot of green. Farther down the drive, the touch of red is provided by a Virginia Creeper vine that has entwined itself high in a tree. I walked down the lane to the bridge over the little river. Today the flow was much more impressive than it was just a few days ago. Agricultural land along the river has drainage and trenching systems that mean rainwater is diverted into the river rapidly following a storm. As a result, the river flow swells quickly in response to wet weather. Presumably, this also contributes to the muddy appearance of the water. Down by the water’s edge, there were a number of blue darners zipping about. Those darn darners! They never hold still to get their picture taken. I was lucky even to catch this guy in the photo frame. It is likely a Mosaic Darner, a member of the genus Aeshna, possibly a Canada Darner (Aeshna canadensis). That would be appropriate. Along the bank of the river, I noticed these mullein (Verbascum thapsus) rosettes. The fuzzy, felt leaves are the first-year growth of the biennial plant. Next year, they’ll put up a flower spike. Across from the river and beside our property is a field planted in soybeans. They’ll be ready to harvest soon. Their summer green is gone and the field is a golden brown. Look at those clouds! One of the nice things about a flat, open landscape are the frequent displays of breathtaking skies. It’s like living in a seventeenth-century Dutch landscape painting. Only without the windmills. This majestic Crimson King maple is beautiful in every season. Hi Mousie! Hi Czarina! Hi Louis! The field behind the barn is beautiful now as the long grass fades to a soft sandy brown and the seed heads catch the sunlight. I didn’t notice the spider until I downloaded the photographs and spotted it, perhaps an Argiope species. Down by the pond, it is much quieter than it was in the spring and summer. After I had stood by the water for a few minutes, however, I noticed a number of reddish dragonflies. One landed on my pants-leg, facing up towards me, and I noticed it had a white face. Then I saw that along the water there were a few dozen red dragonflies, all in pairs. They were dipping down to the water surface, rising up a foot or so, and then dipping down again. It appeared to be females laying eggs in the water with the males in tandem, contact guarding their mate. I was quite sure the dragonflies were White-faced Meadowhawks (Sympetrum obtrusum) until I got back to the house and checked my guide. Hmm. Problem. Both the males and females appeared red, while the females of meadowhawks are usually a dull olive-brown. It’s a mystery. As I returned to the house I noticed a butterfly land on the arm of a lawn chair. There was a fair breeze, and it struggled mightily to get its sail-like wings under control. Finally, it managed to settle on the chair arm with its wings flat and out of the wind. A Viceroy (Limenitis archippus). Not without regret, I returned to the house to tackle more prosaic tasks. A special “Welcome to the Blogosphere!” to Historygirl and SpongeDeb. In addition to indulging an interest in history, international traveler Historygirl is a student of current culture as manifested in popular media. You can visit her new blog at Girl with Remote. SpongeDeb, aka Grammarian, has a long-standing interest in the proper use of grammar. Read her hilarious and imaginative takes on some common faux pas at Grammar Tales. Happy blogging, Historygirl and Grammarian! Perhaps it was the talk of Canadian tarts that inspired Railguy to do some baking. Butter tarts! Awesome! I present this historic recipe as a sort of long-distance welcome home offering for Turtle, who recently shuffled off to New Brunswick. Mix milk, sugar and salt together in saucepan over low heat. Bring to a boil and cook 5 minutes, stirring constantly. Remove from heat. Add marshmallows, chocolate chips, vanilla and nuts. Stir 1 or 2 minutes until marshmallows melt. Pour into buttered 9-inch square pan. Allow to cool and then cut into squares. Enjoy!